Adjust the oven rack to the center position and preheat the oven to 350°F (175°C). 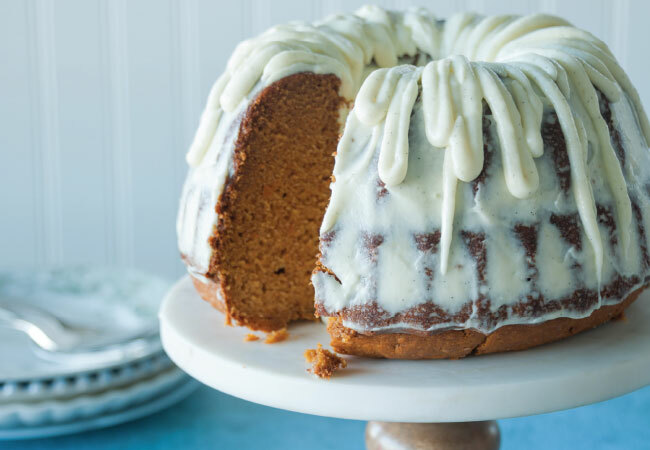 Spray a standard 10-cup (2.5-liter) Bundt pan with cooking spray. 1 hour 15 minutes to 1 hour 30 minutes, or until a toothpick inserted in the center comes out clean and the edges start to pull away from the sides of the pan. Let cool in the pan for 10 minutes, then invert onto a rack and cool completely. Meanwhile, make the icing. In the bowl of a stand mixer fitted with the paddle attachment, beat the cream cheese until smooth. Add the mascarpone, heavy cream, and sugar, then mix on low until uniform. Scrape down the sides if needed to ensure everything is getting mixed in. Add the vanilla bean seeds and the maple extract to the bowl. Mix to combine, then increase the speed and beat for 1 to 2 minutes, until the icing is nice and thick. Put the icing in an 18-inch (46-cm) pastry bag. Snip off the tip. In a small saucepan, combine 1/2 teaspoon salt and 2 cups water and bring to a boil. Stir in the rice, reduce the heat to medium-low, and cover with a tight-fitting lid. Cook until the grains are puffed and tender, 45 to 55 minutes. Drain off any remaining water. Meanwhile, start the squash. 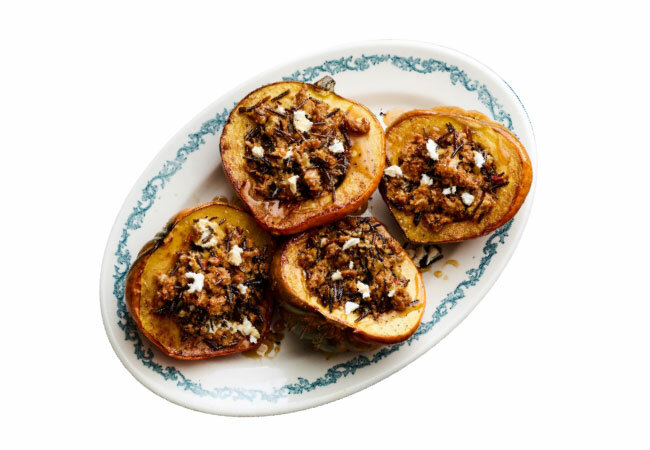 Brush the squash with 2 tablespoons of the oil and season aggressively with salt and pepper. Place the squash cut side down on a rimmed baking sheet. Add 1 tablespoon water to the baking sheet and bake until tender, 25 to 35 minutes. Add the soy sausage to the skillet and stir to combine. Cook, stirring occasionally, until the soy sausage is golden brown and cooked through, 7 to 10 minutes. Add water as needed to deglaze the pan and prevent sticking while cooking. Transfer the soy sausage mixture to a large bowl and toss with the rice and lemon zest. Fold in the goat cheese so that some large pieces still remain but are evenly dispersed. Taste and adjust the seasoning with salt and pepper as needed. Fill each squash half with the sausage mixture and bake cut side up until golden brown, 10 to 12 minutes. Drizzle with the syrup before serving. Carnivore version: Replace the soy sausage with 1 pound bulk Italian sausage. Follow the steps and cooking times as directed above. Plant-based version: Replace the goat cheese with 1/2 avocado, diced. Follow the steps and cooking times as directed above. Put the potatoes in a large saucepan, cover with cold water, and season with salt. Bring to a boil and cook until fork-tender, 15 to 20 minutes. and mix on low just until smooth, being careful not to overmix or the potatoes will become gummy. Season with salt and pepper. 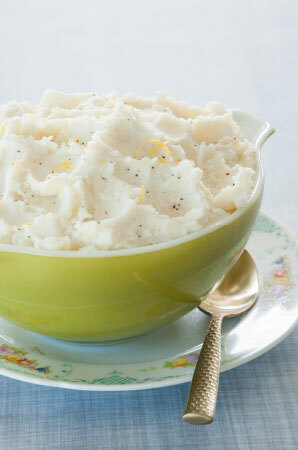 if the potatoes seem dry, add the milk to loosen them. In a sauté pan, simmer the onion in the bourbon until soft, about 5 minutes. Set aside. Bring a large pot of salted water to a rolling boil. While the water heats, fill a large bowl with ice water and put a strainer in it. Drop the green beans into the boiling water and cook until crisp-tender, 6 to 8 minutes. Drain and immediately plunge the green beans into the ice bath to stop the cooking. Drain well. Toss the mushrooms with the oil, season with salt and pepper, and spread on a baking sheet. Roast for 8 minutes. Set aside. In a small pot, heat the broth over medium heat until just under a simmer. Meanwhile, melt the butter in a sauté pan over medium heat. Stir in the flour and cook until golden brown, stirring constantly, about 4 minutes. Gradually add the hot broth to the butter and flour mixture, whisking constantly. Cook until it starts to boil, about 3 minutes. Add the cheese, cream, and thyme and season with salt and pepper. Toss the green beans and mushrooms in the warm sauce. Butter a 9 by 13-inch (23 by 33-inch) casserole dish. Spread the rice in the dish and top with the green bean mixture. Cover with the bread crumbs and bake for 15 minutes. If additional browning is desired after baking, place under the broiler. Eat. 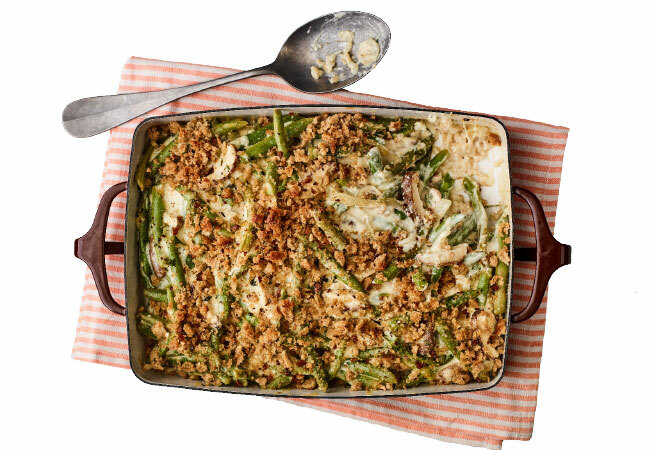 Oh, green bean casserole really is wonderful!